Ray was Farber’s beloved 17-year-old Labrador retriever. New England Pet Hospice and Home Care helped Ray, who had grown incontinent, through his last months, sometimes providing overnight care, with a veterinary technician sleeping on the couch, so the family could get some sleep upstairs. In the morning, technician Nancy Whitlock would get Ray’s breakfast and meds. “Nancy was our midwife for Ray’s death,” says Farber. Though hospices for humans have been around for decades, the pet hospice movement is relatively new and comes amid a recent proliferation in services for pets. According to the nonprofit International Association of Animal Hospice and Palliative Care, there are fewer than 10 animal services in the United States that conform to its guidelines, and New England Pet Hospice is one of them. “The guidelines define animal hospice as a philosophy or program of care that addresses the physical, emotional, and social needs of animals in the advanced stages of a progressive, life-limiting illness or disability,” says Dr. Amir Shanan, who runs Compassionate Veterinarian Hospice in Chicago and is founder of the international association. The group has nearly 300 members, most of them veterinarians. In the past two years, he says, the number of organizations claiming to offer animal hospice services has grown rapidly, and his association is developing a training program for vets and others in the evolving field. New England Pet Hospice covers central and southeastern Massachusetts, Cape Cod and the Islands, southern New Hampshire, southern Maine, and all of Rhode Island. Merrill says it offers physical, medical, emotional, social, and spiritual support for sick and aging animals, most of them dogs and cats — all of it in the animals’ homes. The hospice follows the human model of an interdisciplinary team approach, not just for end-of-life care but also for pets with chronic diseases and special needs. 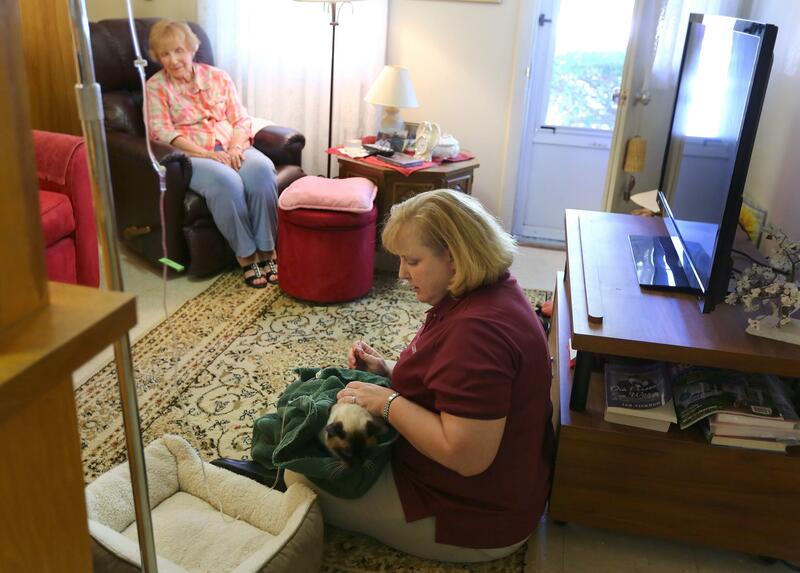 Though some veterinarians say they’ve gotten into the hospice business, many offer only in-home euthanasia. Merrill’s hospice, though it can’t administer euthanasia, will come to the home while a vet gives the injections. Sometimes she has been asked to take the animal to the vet for the final visit, if the family is too distraught to go. Founded in 2011, New England Pet Hospice planted its roots in Merrill’s mind in 1996, after her mother-in-law died of kidney cancer at 63, in hospice. Eight years later, her grandfather died at 94, also with hospice care. The experience gave her what she calls a “premature midlife crisis.” She’d been practicing real estate law for a number of years and wondered, Am I doing enough to help people? It took her five years to fully recover, and she began to volunteer at a hospice in Wayland. She loved the work and became certified, through Mount Ida College, in thanatology, or the study of death and dying. She thought about becoming a social worker or hospice chaplain. Then her friend’s dog was diagnosed with lymphoma. “She was struggling with getting him the care he needed or euthanasia and I said, ‘Let’s get hospice for him.’ ’’ It turned out there weren’t any so Merrill decided to start one. 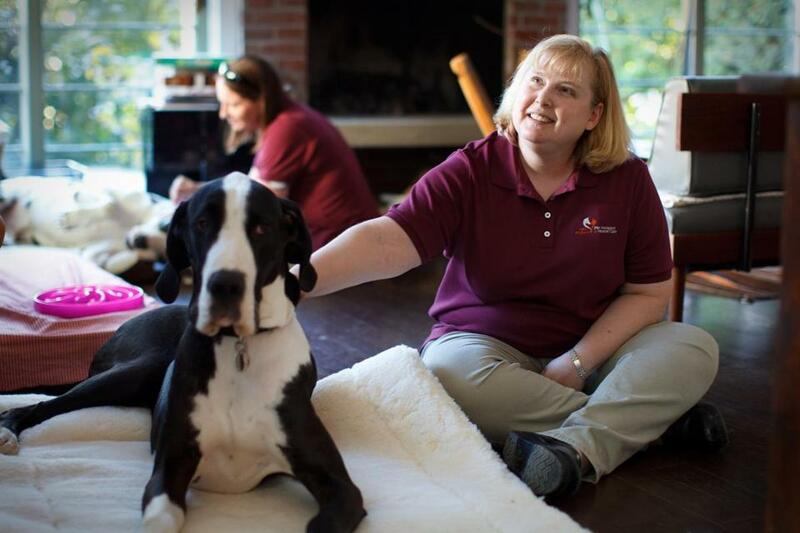 Through the Center for Women & Enterprise, a Boston-based nonprofit that helps women launch businesses, she took classes and wrote a plan for New England Pet Hospice. In 2010, she hired two veterinary technicians. They saw their first patient in early 2011. 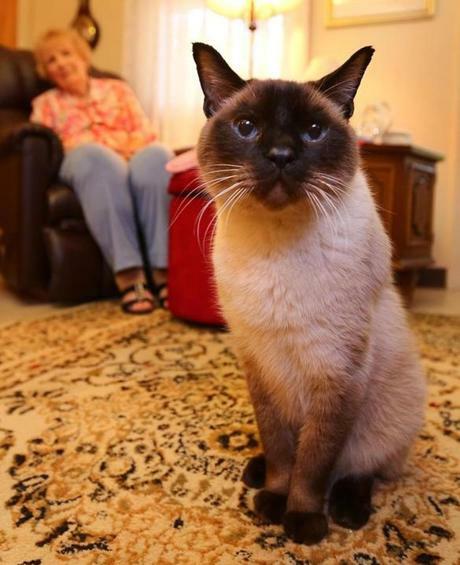 Pie, “13 or 14,” lives in Medway with Eileen Langelo, 89. Pie’s one remaining kidney is diseased; he gets home hospice care. The hospice now has 18 staffers: vet techs, animal-care specialists, hospice assistants, a massage therapist. The animal acupuncturist recently moved to Vermont. One of her early staffers was the Rev. Eliza Blanchard, who is the group’s spiritual adviser. Blanchard, a Unitarian Universalist minister, left parish ministry nearly five years ago to work with animals and their humans. Affiliated with First Parish in Brookline, she conducts pet loss and healing circles and holds interfaith blessings of the animals. A mutual friend introduced the women, both Mount Holyoke graduates, and Blanchard signed on as hospice chaplain. Blanchard is brought in for end-of-life and bereavement issues. “People have huge feelings of loss, and some are flabbergasted because they are more overcome than with grief over human friends or relatives, or they feel guilt about euthanasia. We assure them that this is all normal,” she says. Euthanasia is a burning issue for the hospice: When, if ever, is it time? If the animal is terminal and in pain, hospice recommends a veterinary consult. “We say to people, some illnesses are not conducive to a natural death,” says Merrill. Overall, half their animals die from euthanasia, half on their own. For those with a terminal diagnosis who aren’t in pain, hospice offers the alternative of palliative care, including acupuncture, massage, and home-cooked organic meals, pureed for animals who can’t chew. There are range-of-motion exercises for animals who no longer walk, and special beds that wick moisture away for the incontinent. On a recent afternoon, Merrill enters a small Medway apartment where Eileen Langelo, 89, has Pie, her daughter’s Siamese cat, who is “13 or 14.” Pie has had one kidney removed, and the other is cancerous. Merrill gently pulls the cat from under the bed and begins to warm a saline solution to flush out his kidney. Hospice has been tending to him a couple of times a week for a year. She speaks to Langelo about Pie’s breathing, while the cat’s tail switches. Merrill puts Pie on her lap, swaddles him in a towel, grabs a handful of skin on his nape and, using a silicone-coated, ultra-thin needle, inserts it into fat tissue just under the skin. “Good boy, you are such a good boy, you are the best,” she coos as she finishes, patting his head. Each visit costs $65. Why not euthanize? Ray was not just any dog. At nearly 18, he was Farber’s “first child.” Because Farber travels — her physician husband works weekdays in New York — she needed help as he began a slow decline. In 2005, Farber was diagnosed with LAM, or lymphangioleiomyomatosis, which slowly kills the lungs. She and her husband, Michael, also wanted to show their 7-year-old daughter compassionate care for the ill and dying. “It was important for me to show her how to take care of someone even when it’s not convenient,” Farber says.